The Mayor's City Builder Award is a civic honour created to recognize an individual, group or organization that has, through their outstanding volunteerism or exemplary action, demonstrated an extraordinary commitment to making our city a better place today and for the future. This may include life-long service, outstanding acts of kindness, inspiring charitable work, community building or any other exemplary achievements. Members of City Council or the public may nominate individuals, groups or organizations. Any youth, adult, senior or group in the City of Ottawa who willingly volunteers their time and efforts to benefit others is eligible provided they live in, operate a business in, or volunteer within the City of Ottawa. 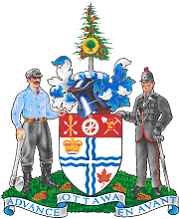 Employees of the City of Ottawa and individuals serving on City of Ottawa committees, boards or agencies are eligible for nomination provided their volunteer activity is not an extension of their role as an employee, committee, board or agency representative. To nominate a candidate, the nominator should complete the nomination form describing the efforts and achievements of the nominee. Nominations for the Mayor’s City Builder Award may be completed online. The award recipient will be presented with a certificate from the Mayor and the Ward Councillor at the beginning of each Ottawa City Council meeting. The Mayor's Office will coordinate with the recipient's attendance at council. Recipients will be selected by the Mayor and notified by the Mayor's Office. The award will be presented at the beginning of each Ottawa City Council meeting. There is no deadline to apply and nominations shall be valid for one year after submissions, during which time the nominee may be selected to be recognized. Nominations must include at least one reference that may be contacted to verify the nature and extend of the nominee's volunteer activity. References should be those familiar with the nominee's accomplishments. Members of the nominee's immediate family may not be submitted as references. Additional material in support of this nomination for example reference letters, resumes, media stories and more. I certify that the information submitted is true and accurate to the best of my knowledge. Personal information is collected under the authority of the Municipal Act RSO 1990, c.M.45, s.207 (45). Personal information will be used by the City for the purposes of evaluating the nominees and notifying recipients of the Mayor’s City Builder Award. Questions about this collection and use of your personal information may be directed to the Mayor’s Special Assistant at 613-580-2424 extension 25426 or email matthew.bickford@ottawa.ca.